Quarter finals weekend of the Norfolk Ladies League Cup 8 sides vying for a place in the semi-finals. Just 3 sides from Division One left in the competition and two of those were to meet this weekend the holders Bungay Town Ladies out of the League Cup following an infringement of the rules. The all Division One clash saw Thorpe United Ladies and Gorleston Ladies meet for the 4th time this season. Thorpe runaway leaders in the league coming out on top of all 3 previous encounter albeit to penalties in the County Cup. Thorpe with home advantage in the League Cup windy conditions a goal from captain Rebekah Lake and a brace for Millie Cursons making her debut having joined from Aylsham enough to see Thorpe into the last 4 winning 3-1 Samantha Hunn scoring the goal for Gorleston. Sprowston Ladies the other Division One side to have reached the quarter finals of the League Cup, going strong in the league itself, are the current League Plate holders through to the last 8 of the League Cup were drawn at home to Fakenham Town Ladies challenging for top spot in Division Two and an immediate return to Division One itself. 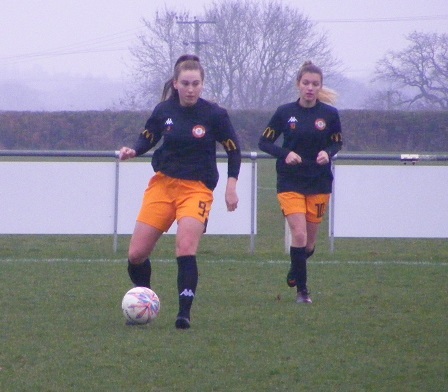 It was a performance Fakenham will want to forget, get out of the system as they were beaten heavily by Sprowston, top scorer Victoria Leyer scoring 5 herself in the match including a long range effort from a free-kick. Hannah Roe and Abby Hutchin both scoring two each with Millie Drake scoring her 1st Sprowston goal in a 10-0 win. A minutes silence held in honour of Michaela Yeates before the match between Taverham United Women and Freethorpe Ladies on Sunday. Has played for both teams sadly lost her battle with cancer recently. Freethorpe up against a young Taverham side top of Division Two unbeaten with just two points dropped so far this season those claimed by Freethorpe on the opening day of the season. Brought down to earth in the County Cup at the weekend losing for the first time this season Taverham returned to winning ways to book a place in the last 4 of the League Cup on Sunday. Leading by a single goal at half-time Taverham went on to add a further 2 goals 2nd half to win 3-0 their goals scored by Hannah Artis, Katie Dunning & Charlotte Hurren. Tavern Ladies are the final side to reach the last 4 of the Norfolk Ladies League Cup the Division Two at home to fellow league side Hockering Ladies in the quarter finals, they the side benefiting from Bungay Town’s expulsion. Tavern have played less games than anyone else in the league but are scoring plenty of goals & when they win they usually win big a 12-1 win against Hockering in the league early in the season Katie Hart-Copsey scored half of that tally, scored 4 more this weekend to take her onto an impressive 30 goals for the season. Also scoring 4 in the game was Atlanta Griffith who now has 14 for the season. The score 12 once again without reply Lucy Kean and Nicole Cousin both adding two goals each to the score. The sides missing out on the quarter finals of the League Cup going on to contest the Ladies Plate competition now into it’s 3rd season. 1 game in the 1st Round to be played with all the other sides receiving a bye to the quarter finals. Division One side Wymondham Town Ladies were at home up against Division Tow side Horsford Women. Wymondham proving the stronger side on the day the higher league side progressing comfortably winning the game 9-0. One match played in Norfolk Women’s Division Two at the weekend with 4th placed Bure Valley Wildcats Ladies travelling to Thetford to play bottom side Bulldogs Ladies on Sunday. Bure Valley are scoring plenty of goals too and a 5-1 win at the weekend sees them consolidate 4th position in the league but it remains very tight in the middle of the table with the 4th to 8th placed sides separated by just 5 points. This entry was posted in Norfolk Ladies League Cup, Norfolk Ladies Plate, Norfolk Women's Division Two, The Round-Up and tagged Norfolk Ladies League Cup, Norfolk Ladies League Plate, Norfolk Women's Division Two, The Round-Up on January 30, 2019 by WFEast.